Blame! Wallpaper: The one To Blame! Minitokyo »	Blame! 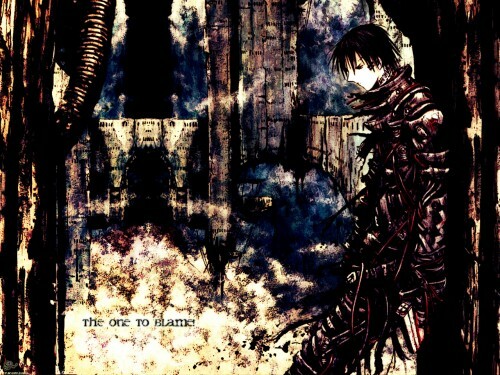 Wallpapers » Blame! Wallpaper: The one To Blame! I know this one is extremely dark...but this can't be helped since mood is so...excruciating. here also. I dunno maybe later I can try to brighten it a little if people really wants to see. 13 layers with this one...yeah...Almost all I have done is the rebuilding. It took 4.5 hours. Browse Blame! Gallery: Recent | Popular. and the chara is so cool!!! the bg and the hard mix that you did is awesome!! just love this wall!! adding this to my favs for sure!! So... I think that in spite of the fact that your wallpaper is very dark I like much, it gives a very different appearance though very used by the minitokyo ... many are in the habit of using the dark like it you have applied, but about any form I think that his wallpaper is nice. Ado for the present time there says goodbye your friend Maldita42 from méxico. i love the bg...it looks so good...me love me love!!! Its really cool i've never seen the anime but your wallie is really amaizng i love the character there too! Excellent work another amazing wallie! this is by far(i think) the darkest, grungiest wall you have made..i think.. but absolutely looks mysteriously gorgeous..good post dude..
Well I like the darkness so I think this is good but you always make good wallpapers. Wow, I just finnished reading the manga, going on to Noise now. Neat wall! It realy catches the mood of the comic. Great effort and great outcome! Fav. Awww this would be one of the greatest walls ever (and would stay on my desktop for a LONG LONG time) were it 1600x1200. It really looks great though. I love it.. If you ever feel so inclined to do so, I know I'm one person who will extremely appreciate a 1600x1200 variation! Thanks for sharing. loving this wall, awesome style such art in here kep it up! Very nice image of Killy. Very good, nice work!